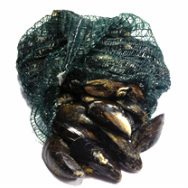 In 2012 we got a phone calling asking if The Cornish Mussel Shack wanted to be filmed for a new series on Food Network." In this new series, Andy Bates travels the country, visiting the UK's most vibrant food destinations. He explores the world of street food to find the stories behind the recipes and the people. Andy Bates, aka Pie Man, is known for his hearty, traditional British street food which he sells on his stall at Whitecross Street market." "Andy’s culinary curiosity leads him to the South West and Cornwall. He tries a Cornish Cream Tea and is inspired to bake a retro pud - pineapple upside down cake. At Truro Farmer’s Market, Andy discovers The Cornish Mussel Shack, a stall run by Matt and Phil who sell hand-picked mussels. They invite him to go free diving for mussels under a giant ship on the River Fal and then try out Matt’s Cornish Cream Sauce and Caribbean Spicy Sauce on The King Harry Ferry. Andy pays a visit to Cornish pastry maestro, farmer Sarah, and receives a crash course in rough puff pastry making, which he uses to make a beef and cheese pasty."